Check out our Trade Program! Throughout the summer we will be hosting mini sales in our fiction departments. The dates for each sale will be determined soon and will be announced on signs at the store as well as on social media so be sure to follow us! New Books Coming Fall 2019! 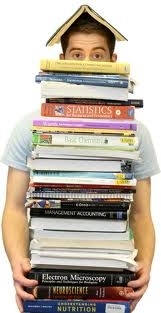 We are always striving to offer our customers a wide selection of books and gift items. Because of this we have decided to look into offering new books! We are very excited to be able to curate a selection of gift items and new titles for adults and children. We want to hear your opinions! Please let us know via social media or at the counter what kind of books you would like to see!! We know this will be a process and a change from what we have always done, but please don't worry! While you can't use book credit on any NEW items you will still be able to use it on the 40,000 USED books in our inventory. We are working very hard with our distribution agents to be able to offer you the best discounts possible on new books. We are excited to hear from you! let us know what you want to see in store! 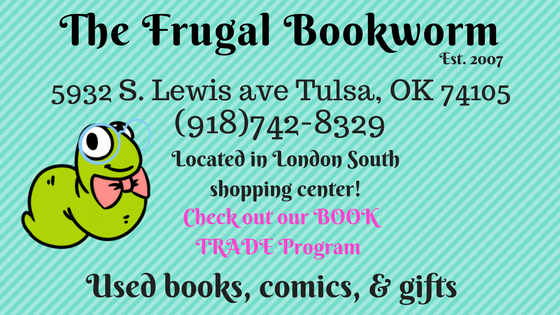 We are a locally-owned, woman powered business in south Tulsa. Our store may be on the smaller side but there are endless treasures to be found on our shelves. We have an in house inventory system that tracks every book we have in stock so that we can quickly find them for you! With over 45,000 books in stock we have something for everyone! Our focus is You, our customer. We want you to enjoy your reading experience both during the selection of your books or gifts and after, when you are enjoying a new book (or a new possession) that gives you all the pleasure you anticipated when you selected it at the store. Please stop by and visit with us. We look forward to meeting you! And, if you have books that you have finished, think of us. We have a wonderful BOOK CREDIT program that can get you up to 50% off our list price!! What we can't use we donate to organizations such as: Blue Star Mothers, Churches, Day centers, Charter schools, Little Free Library Divisions, and More! Don’t discard, recycle your books – and share them with other avid readers like yourselves! We unfortunately no longer purchase books for cash!